Alan Windsor Price was born 3/22/07. 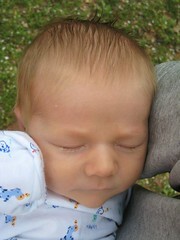 This picture was taken by his Aunt Livi when he was about 10 days old. You can practically smell him he's so cute in this shot! But maybe it's just the prejudice of granny cat.